CICS offers teachers 8% raise in first year of contract—if they’ll agree to cuts in social workers, counselors, student programs, puny raises for low-wage paraprofessionals. 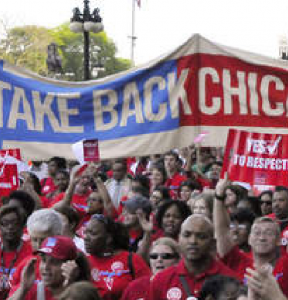 CHICAGO—CICS management is sitting on $36 million in public education funds as a February 5 strike date looms—and the CTU learned Saturday morning that management will spend some of those dollars to hire strikebreakers. CICS schools have hired a for-profit substitute teacher company to help line up strikebreakers. They are offering to pay temporary workers time-and-a-half—$21.75/hour—to scab. That parses out to an annual pay rate of over $40,000—a third more than CICS currently pays many paraprofessionals, some of whom earn barely $30,000/year despite having bachelors or masters degrees and years of service to CICS students. CTU members condemned management’s strike-breaking scheme, and will mount informational pickets Monday at four unionized CICS schools starting at 6:30 AM Monday. The union has set a Tuesday strike date if no agreement is reached at the bargaining table. Informational pickets go up at 7AM Monday at the following Chicago campuses. 7:15 AM Press availability: CICS – Northtown HS. 3900 W. Peterson Ave. The union estimates that CICS management could avoid a strike by spending less than 10% of the $36 million in public dollars they’ve siphoned from classrooms. That redirection of public dollars to classroom needs would save the jobs of counselors and social workers, cut class sizes, reduce high staff turn-over and the disruption it causes to students’ educations, and allow paraprofessionals to earn a living wage. Acute staffing shortages and corporate cost-cutting at some schools has led to paraprofessionals staffing classrooms instead of subject-trained teachers—at far lower wages. CICS pays its teachers on average $8,000 less than teachers at district schools, while pay for some paras is under $29,000/year—even when they’re teaching classes in lieu of teachers. CICS owns a series of subsidiaries called CMOs, or charter management organizations. These shell companies leave CICS schools paying multiple rounds of “management fees” that can siphon off close to 30% of the public dollars CICS receives. Top management positions exploded in the last three years, as well, from four six-figure salaries for top bosses in 2017 to 14 today. CICS CEO Elizabeth Shaw earns almost as much annually to run 14 schools as CPS CEO Janice Jackson, who oversees more than 500 schools. CTU members and allies will stage a series of parallel actions this week to target CICS management, the charter industry honchos who back them, and the for-profit substitute company that is collaborating with CICS bosses to line up scabs. As you may be aware, there is an anticipated teacher strike at Civitas Schools scheduled to begin on February 5th, 2019. CSTN has been requested to staff classrooms for four campuses in order to provide stability and engaging learning experiences for students during this time. 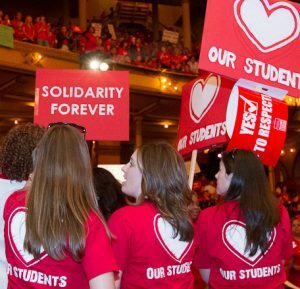 CSTN supports Chicago teachers in their efforts to secure pay raises, smaller class sizes, improved Special Education resources, and better wages for paraprofessionals. To meet student needs during the strike, CICS will be offering time-and-a-half pay ($21.75/hour) for guest teaching at CICS Wrightwood, CICS Northtown, CICS Ralph Ellison, and CICS ChicagoQuest. Please note that accepting these assignments may entail crossing picket lines upon arrival at the school. Select an open assignment. If the strike is extended, we may reach out to request additional days. If the strike is cancelled, we will notify you right away. Please direct any questions to our Operations Team at teachers2@cstnchicago.com.